The tropical weather in the Atlantic Ocean here recently has struggled mightily to even develop a tropical system. 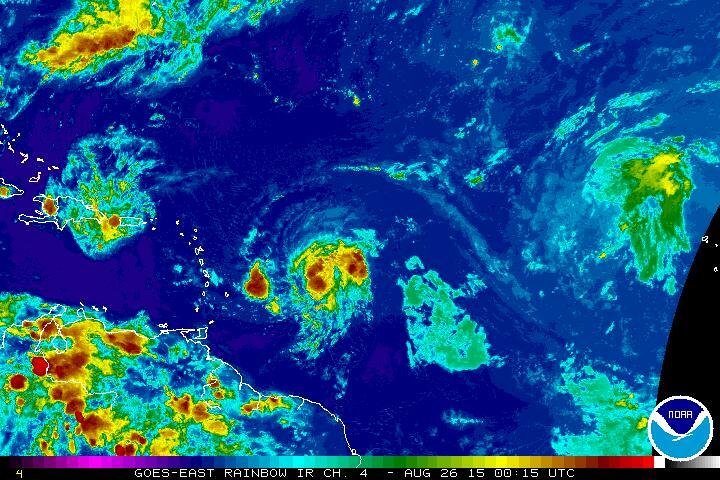 Last week there was Danny, which became a major hurricane before fizzling out as it approached Puerto Rico. This particular map shows which areas across the Atlantic are being affected by what is known as the Saharan Air Layer. In recent months, there was an abundance of such (noted by the orange and yellow colors). However, there has been an upward trend in the amount of tropical waves recently across the Inter Tropical Convergence Zone. There was Danny last week. This time around Tropical Storm Erika has developed in this area. Let us get into the details of Erika as we know currently. Tropical Storm Erika this evening is currently moving west across the Atlantic. Erika is headed in the general direction of the Leeward Islands currently. Movement on the 8:00 PM advisory is pegged at 20 miles per hour to the west. Top sustained winds currently are at 40 MPH. This map here shows tracks of previous tropical systems that have developed in the same area where Erika is tonight. There are some famous hurricanes on this list, including Hurricane Andrew from 1992. While Erika will most likely take a different path from these tropical systems in the past, it is important to note the history of such. The latest projected tracks keep Erika east of Florida through the next several days. However, a trend towards the west has been noted. There is one outlier (Canadian) that brings Erika into the Gulf of Mexico. 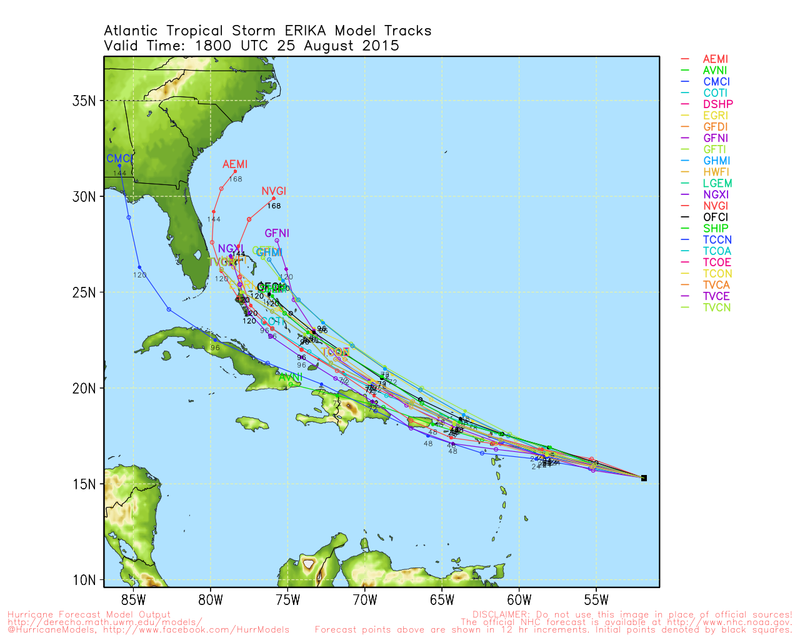 Plenty of forecasting remains to be done with Erika. We will be watching future forecast model runs to pinpoint the track of Erika. 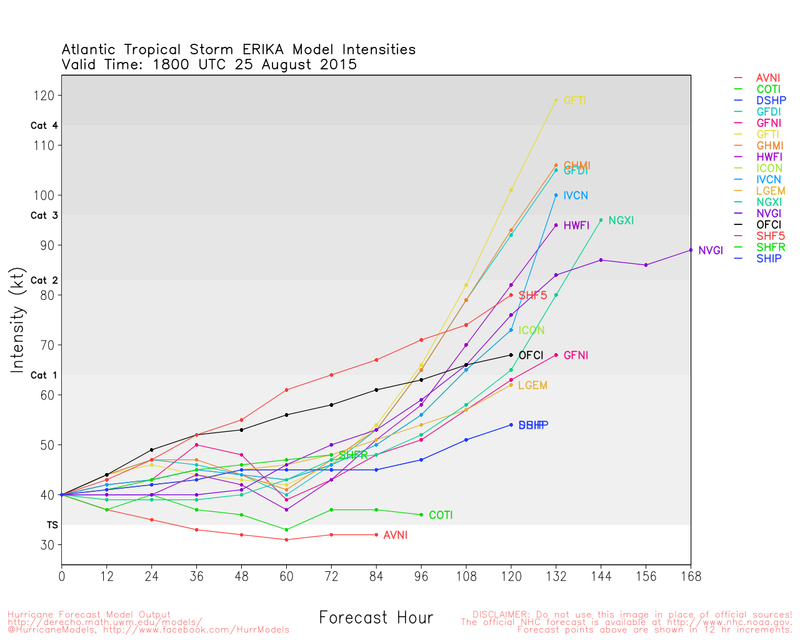 A good portion of the tropical weather models do bring Erika to hurricane strength within the next few days. 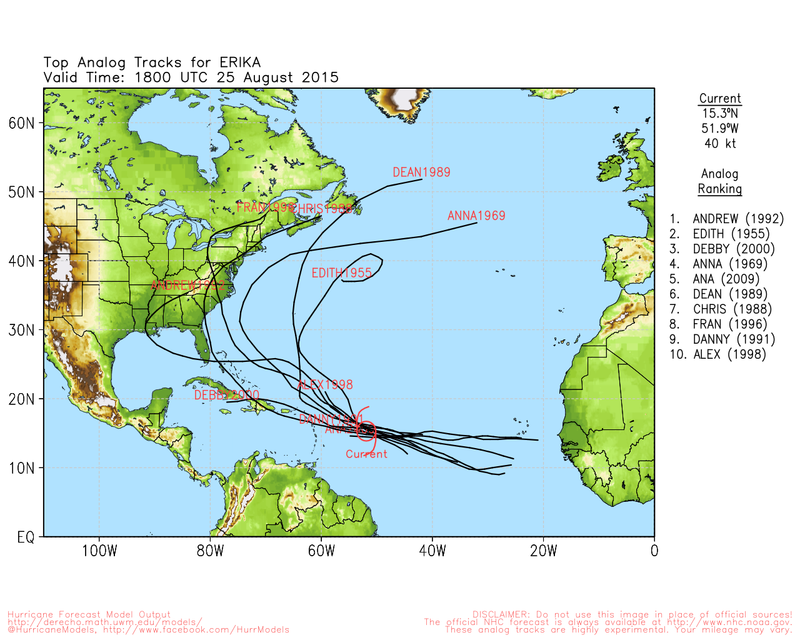 A few do ramp Erika up to *Major* hurricane status in the next five to seven days. We will continue to monitor Erika for you over the next several days. Stay tuned. Posted on August 25, 2015, in Uncategorized. Bookmark the permalink. Leave a comment.